This is a coyote, but it obviously has a dog somewhere in its ancestry. We have a name for these particular white markings in domestic dogs. It is called Irish spotting or Irish markings. No wild canid has this coloration. The existence of these markings is indicative of domestic dog genes within a wild population. 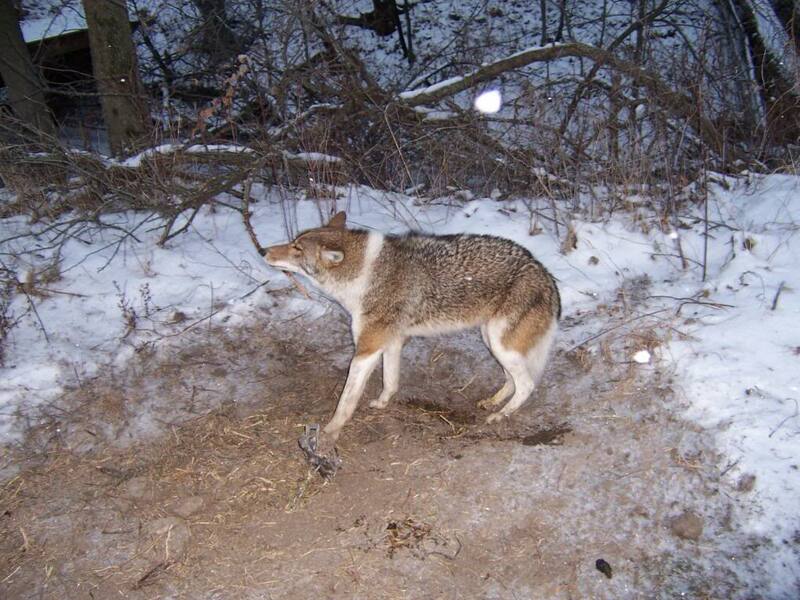 This coyote got likely its white markings from a dog ancestor that bred with a female coyote. The hybrid was fertile and had enough coyote characteristics to survive in the wild and mate with another coyote. The dog ancestor is likely several generations away, for this animal really looks very much like a coyote, just with unusual markings. These particular white markings are very hard to get rid of in domestic dogs, and it is likely that they are very hard to lose within coyote populations once they are introduced into the gene pool. And you still doubt the studies about the black wolves getting their coloration from the same source? If you can get Irish markings from dogs, you can get also get black color from them.